My name is Godfrey and I am the computer superviser at Ntugi Secondary school. 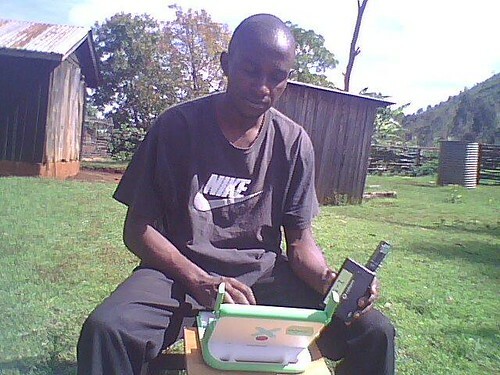 I am a former student from Kibirichia Boy's Secondary school. The community being a computer illiterate area, I had to try and help our students get some more knowledge of the computer and internet. I use the OLPCs and cradlepoint, but the only challenge comes to energy especially a time like now when the sunshine duration is short because we use solar. Being over the holiday it can't be possible to blog at school, so one has to carry an OLPC laptop and a cradlepoint home to ease the internet access. Its good to have these computers since they are portable and can stay with charge for some times. Its also good since with the presence of cradlepoint one can access internet. Right now since the school are closed I took one computer, one cradlepoint, a stick and our data SIM card home so that I would still be accessing internet. As the photo below indicates. Back at school it has been good since more and more students are getting used to computer usage. Actually a good number of form three students are currently up on facebook and are exploring internet more and more. The only challenge is the number of students per one computer is so big (one laptop per sevens students).